Another of our new outdoor showers, this very chic, modern design is interpreted as a stunning single-piece stainless steel shower column, angled at the top to create the incorporated shower jets with anti-lime nozzles. It has a discreet, hand-operated mixing valve which simply turns left or right to deliver cold or hot water... you control the temperature. It comes with its own ground fixing and water supply system, as well as in integrated water emptying system. 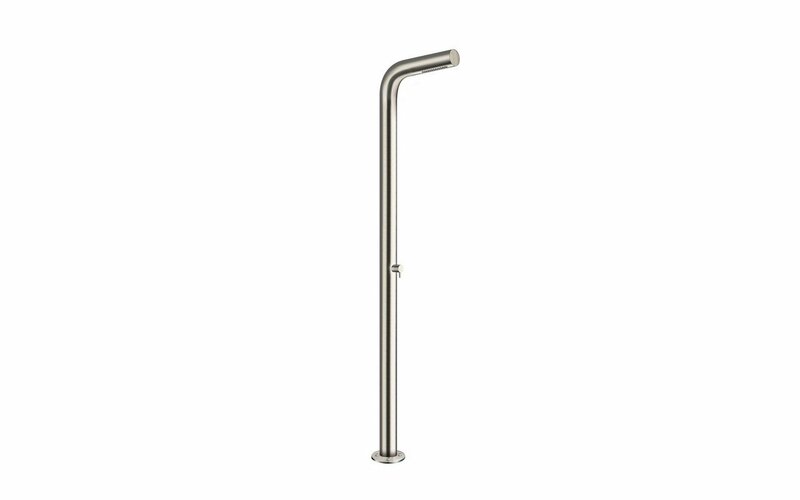 The Gamma-520 freestanding outdoor shower is manufactured in high grade stainless steel AISI 316L, the best grade for outdoor application as it includes a percentage of molybdenum which provides superior corrosion resistance. This also makes its suitable for use in high-saline environments such as coastal regions. This outdoor shower can also be floor-mounted as a very smart indoor bathroom or wet room addition. It also works as the perfect complement to our outdoor bath models. The Gamma-520 freestanding outdoor shower is 2.25 metre high with a 10cm diameter column.